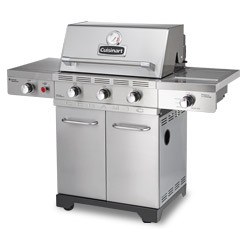 This 670 sq in grill has all the gourmet features plus the patent pending Ceramic Heat Technology™. 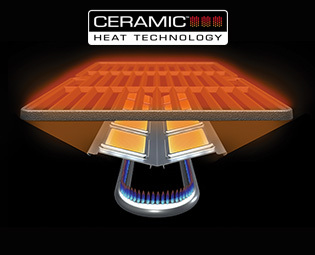 This system elevates your cooking capability by offering the most even and reliable cook surface temperatures, to help you achieve the best cooking results. Stainless steel burners and stainless steel cooking grates provide quality you can see and feel. The Infrared Rear Rotisserie Burner and Infrared Zone Side Burner will expand your outdoor cooking capabilities allowing you to sear, sauté, grill and rotisserie with the turn of a dial. Versatile Double Burner Cooking System: Three stainless steel double burners offer superior burner to grill surface coverage, resulting in even, consistent heat, reduced cold spots and fewer flare ups. Infrared Zone Side Burner: Offers the versatility to cook at extreme temperature, from high intensity heat for searing steaks to gentle temperatures required for seafood. Stainless Steel Cooking Grates: Offer the most durable and easy to maintain cooking surface, while providing excellent heat transfer and retention. HeatLoc™ Convection Hood: Offers maximum heat retention, stable and precise cooking temperatures for moist and flavorful results.